I am not sure all movies are created equal. In the sense of reviewing a film after viewing it. I think, or at the very least would like to hope, that filmmakers have some goals they are trying to achieve when they sit down to make a movie. I would strongly think that each director’s goals are different. When I write letter grades down at the end of each of my reviews, those aren’t letter grades of the movie per se. They are a measurement of how I think the director achieved his goals and how it stacks up to other films in its genre. That’s what Roger Ebert did, and it’s a barometer I wanted to adopt. When you look at a movie like “Geostorm,” you have to go into it knowing it’s going to be both ludicrous and ridiculous in equal measure. When the crew set out to make “Geostorm,” it’s clear that they didn’t have major awards on their mind. They aren’t setting out to change the world. They aren’t trying to make a brain stumper, something that will impact you as you leave the theater and go home. I would argue that every disaster movie fits this mold. Should I even waste time trying to tell you how “Geostorm” makes zero sense on a logical or narrative level, but perhaps you could find some fun in its premise. “Geostorm” tells the story of a space station and machine called The Dutch Boy. It’s a big ship of satellites that can control climate, even stopping a typhoon in Shanghai. But one day somebody on the station sabotages the Dutch Boy, triggering a geostorm, which is a global cataclysm of bad weather, and if somebody doesn’t get the station under control, this cataclysm will eventually destroy the world. The government sends up Jake Lawson (Gerald Butler) to get it under control, he was kicked off the station three years prior due to stopping a typhoon without governmental approval. So, it’s kind of “Olympus Has Fallen” with bad weather. Gerald Butler is pretty much your typical Gerald Butler, and I am starting to notice he pretty much is the same guy in each movie. Same ex-wife, same broken family, same bad attitude who turns heroic on a dime. He may just be the same action hero stereotype in each film. He’s fine here, but it’s easy to notice. The cast is full of good actors, like Ed Harris, Abbie Cornish, Jim Sturgess, Andy Garcia and Robert Sheenan. 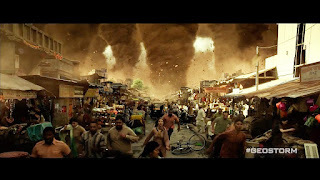 Everybody does exactly what they were asked to do, and in these disaster movies, no matter how uncannily stupid the premise, they attract big stars and they are required to take it seriously. These guys do what they are asked to do. What’s surprising is just how mediocre the visuals are. I couldn’t believe how cartoonish so much of the special effects were. There is a moment when a fire breaks out from under a road, or when an ice storm destroys a beach or a massive electrical storm. What blew my mind is how fake it was? I mean, we are in the golden age of visuals, right? Did the entire budget go towards the actors and not what’s on screen? Because for disaster movies, you need good visuals. To treat the main ingredient that draws audiences as secondary was a mistake. The film works best when it’s just a silly action movie. I think most of these disaster movies begin to flake out when they try to do too much, get a little too ambitious. The malfunction of a climate control space station that is wreaking havoc on planet Earth has potential for a good movie. But when they throw in the government conspiracies and the generic bad guy, I lose interest fast. That was the biggest flaw in “Geostorm,” that and also the horrendous special effects. Everything else is what you would expect from a typical disaster movie. I can’t fault a disaster movie for being a disaster movie. I just wish it wasn’t so overly-ambitious.